Organic calcium sources like dolomite lime and ground oyster shell are relatively cheap and readily available, but your kitchen generates free organic calcium you probably didn’t know about—eggshells. Dried, ground eggshells are a great source of calcium for vegetable container gardens and salad tables. 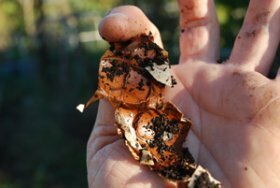 Organic gardeners know that if you just toss eggshells into the compost, they’ll disappear quickly in a hot compost pile, but they’re surprisingly resilient in cool composting systems like static compost piles or a worm composting system. The reason for this lies in the membrane between the embryo and the shell, which has evolved to be highly resistant to microbial attack, even when the shell is cracked. As long as the membrane is moist, the embryo remains protected. Long after the egg sizzled in the pan, the membrane under the shell continues this protective function in your compost pile or worm bin. Eggshells eventually do break down even in cool composting systems, but you’ll have big chunks of shell left in your compost or worm castings. It will be many months before the calcium in these chunks becomes available to your vegetables. The trick with using eggshells in the garden is to dry them out first. Once the protective membrane has dried out, the shells can soak up moisture—and microbes—from the soil, and begin to break down. 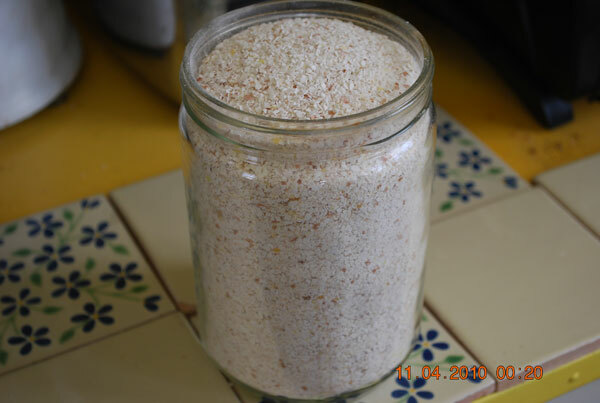 Dried, ground eggshells have an NPK value around 1.2-0.4-0.1. The nitrogen content varies with the amount of egg protein left in the shells. 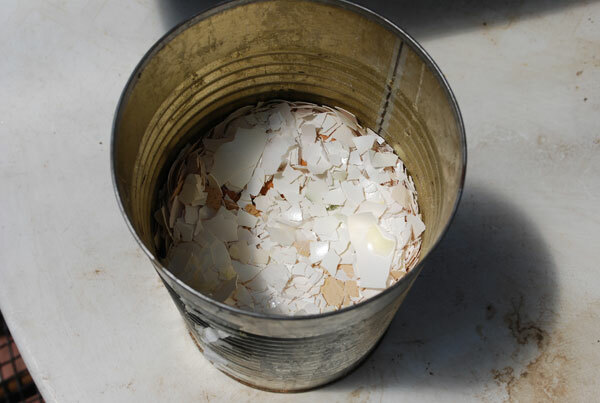 Eggshells also contain significant amounts of calcium, as well as trace minerals. This free organic calcium source is great in potting mixes for container vegetable gardens, for transplanting mixes to pot up seedlings, and as a way to neutralize excess acidity and provide grit in worm composting systems. Use 1-2 Tbs per gallon of potting soil, or up to ½ cup in a 5-gallon pot. Cruciferous vegetables, lettuce, and spinach all thrive with finely ground eggshells mixed into their soil. Tomato, pepper, and squash seedlings grown with a small amount added to their potting mix are particularly robust. 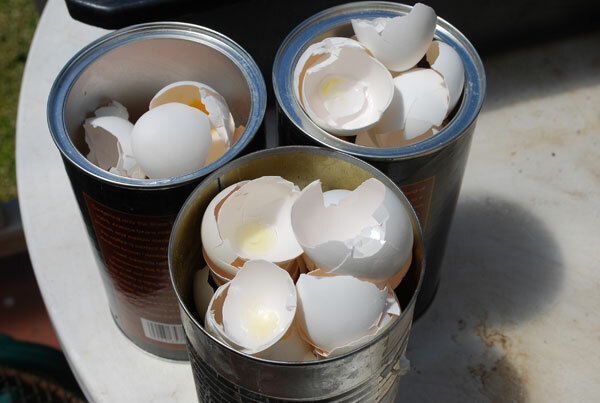 Dry egg shells in a coffee can. After cracking the eggs into the pan, toss the shells into a coffee can and place it on top of the fridge. It’s okay if a little egg white is left in the shells—it increases the nitrogen content of the eggshells—just don’t put yolks or large amounts of egg whites into the shell can. As long as it’s mostly eggshells, you won’t have any problems with odors or insects. 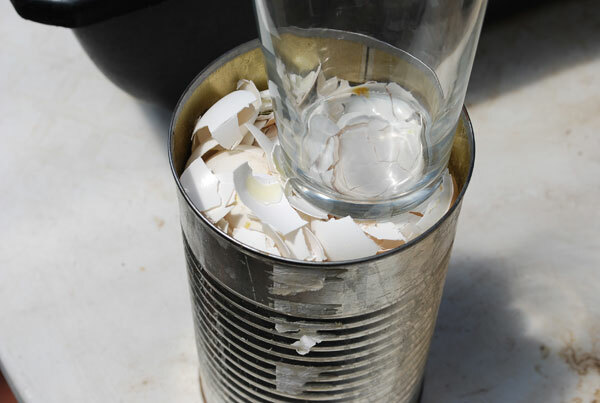 When the can is almost full , crush the shells down with the bottom of a glass or jar. 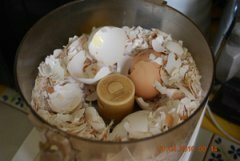 Do this when the last eggshells you added have dried for 2-3 days, then continue to add eggshells as you use eggs in the kitchen, and crush them down a couple days after they dry out. In 2-3 months, the can will be almost full. There will be a pound or two of coarsely crushed eggshells. It’s surprising how much accumulates just scrambling eggs 2-3 times a week. More, if you do any baking. 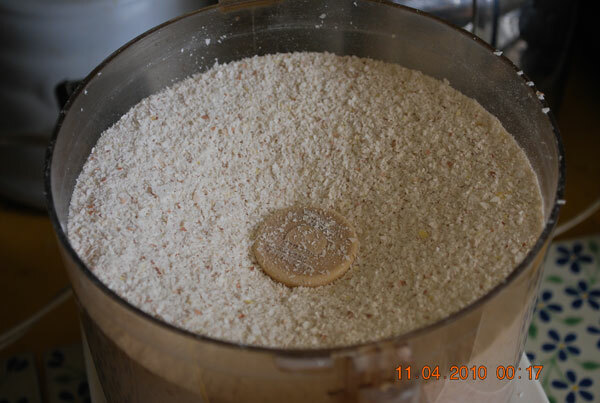 Place the dried, crushed eggshells from the can into the bowl of a food processor. 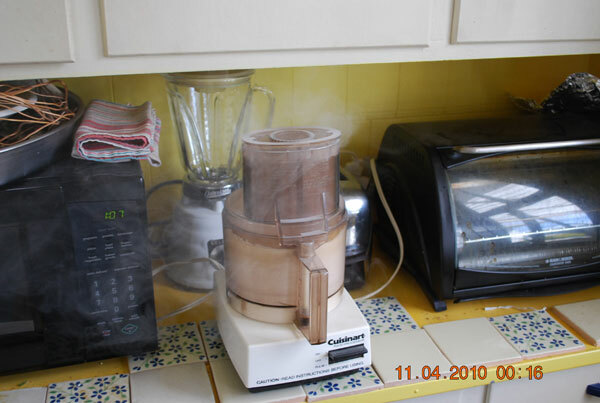 Process the dried, crushed eggshells in a food processor for 1-2 minutes, grinding them into a coarse powder. This is a noisy and dusty process, so it’s best to open the windows, turn on the kitchen fan, and walk out of the room for a minute or two. The finer the grind, the more quickly the calcium becomes available to your vegetables. A mixture of fine and coarse particles is best. The fine particles supply calcium early in the season, and the coarser particles break down throughout the growing season. Store in a jar with a tight-fitting lid. Use in seed starting mixes and container gardening potting soil, or as an organic calcium source for your vegetable garden. In large amounts, dried, ground eggshells can be used for raising soil pH, but it’s better to spread this valuable organic calcium source around, and use it in small amounts with many plants. Especially when organic calcium sources like oyster shell flour are available.